Classic Snap Frame Sign Holders | Retail and Restaurant Signage Hardware | Clip Strip Corp. Clip Strip Corp. snap frames in this category are great for in-store and restaurant signage. 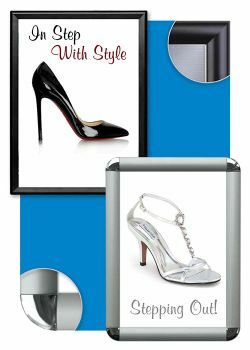 With these sign holders you get a modern style, an easy to use marketing tool, and a wall poster/sign holder that has a protective clear sheet that protects your print materials for years. Our sizes range from 8.5” x 11” up to 30” x 40” giving you many different options and colors to choose from. We provide instructions on use and all the hanging accessories you need to get your sign up in a few minutes. Change out messages as often as you like. Keep in mind, the poster size indicated is what will fit into the snap frame, however the profile size references the thickness of the frame, and how much of your poster/insert will be covered by the frame itself. Clip Strip Corp. carries many other wall mount and countertop sign holders, you can go here to our main sign holder section and find exactly what you are looking for. 24" x 36" snap frame with a 1.25" profile.